OEG Offshore (OEG) – which specialises in the design, build and rental of specialist A60 cabins and cargo-carrying units for the offshore oil and gas market, has delivered several high value ROV (Remotely Operated Vehicles) module contracts worth GBP 1.8 million (USD 2.5 milllion) for TechnipFMC, Saipem and other leading subsea contractors. The TechnipFMC order involved two new high specification 20-foot ROV workshops for worldwide use, the upgrade of DNV 2.7-1 A60 ROV control cabins along with modifications to general purpose 20ft storage units. A further order of three DNV 2.7-1 / DNV 2.7-2 A60 control cabins from a division of the French oil-services firm has increased the order book for 2018. The work scope consists of the design, manufacture and supply of a specialist maintenance cabin, safe area cleaning unit and subsea inspection cabin used for riser inspection, all for use in international waters. Saipem contracted OEG to upgrade several 20ft ROV control cabins and workshops, all originally supplied by OEG Offshore, from safe area to Zone II specification for use on large-scale projects in Europe. To achieve the increased certification OEG carried out major electrical works, installation of full pressurisation, fire and gas systems and other critical safety equipment to comply with Zone 2 requirements. Integration of Saipem free-issue custom ROV control units was also completed. Recognition by the industry for delivering high-quality units to this sector secured repeat business from a Houston-based subsea oilfield construction company for a second DNV 2.7-1 interlocking 13.5- and 6.5-foot insulated and lined, safe area ROV unit. It will be used to support offshore activities in the Gulf of Mexico. “Our units are not only designed to comply with DNV 2.7-1 and A60 standards where required, but can also be upgraded to Zone II for use in hazardous areas to enable cost-effective transportation around the world. Our comprehensive understanding of the nature of work that our subsea customers are involved in deliver designs for ROV cabins and workshops geared towards creating an ergonomic workplace for employees. This enables a more fluid working environment that reduces stress and increases productivity, with the aim of minimising man hours and consequently, costs,” Hunter continues. 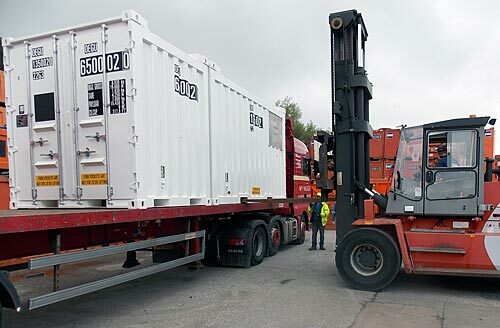 In addition to sales, a long-term rental contract for a fleet of modified A60 engineering cabins has been extended by a US-based subsea supplier to support ROV operations offshore Egypt and Israel.